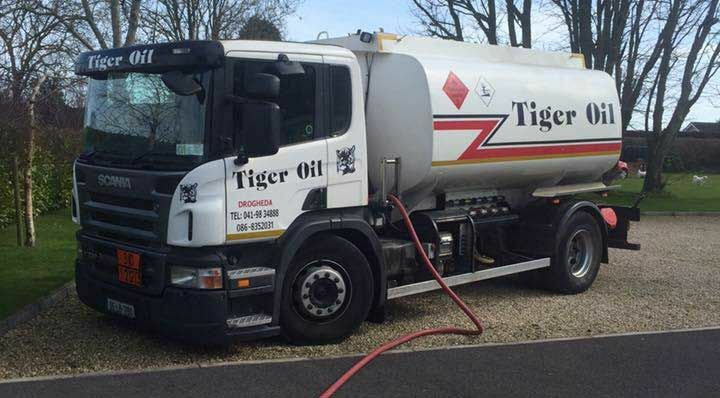 Tiger Oil operates a complete oil delivery service across the greater Drogheda area for Kerosene oil, Marked Gas (agricultural) Oil and Diesel Oil. As a family run business we have been serving the local community and surrounding areas for over 30 years. Our reputation for quality customer service and prompt delivery is second to none. We specialise in domestic oil services. Tiger Oil continuously endeavours to provide its customers a flexible service to cater to their specific needs. Whether you are looking to fill your entire tank or just top it up for the season ahead, Tiger Oil has you covered. We offer competitive pricing and our expert staff are on hand to assist you throughout the entire process. Our expert consultation service will see you on your way to filling your oil tank with the correct oil at the right amount to suit your budget. Why not call us today to see how we could assist you and your family with your domestic home heating solutions. Tiger Oil guarantees next day delivery and in most cases can deliver your oil to your home that very same day. Call us now to hear more about our amazing prices and our personal services. To arrange for you oil to be delivered to your home or business, call us now!